Wisconsin Free Legal Answers (WFLA) is having a good year thanks to the great efforts of our volunteers. WFLA is the online legal clinic established by the Commission in partnership with ABA Free Legal Answers to provide an opportunity for qualifying Wisconsin residents to get answers to basic civil legal questions from volunteer attorneys. Since its launch in 2016, more than 1800 Wisconsin residents have used WFLA to ask over 2,000 civil legal questions. We are especially pleased to see that one of our top volunteers, Linda Lewison, was selected by the State Bar of Wisconsin as the Pro Bono Attorney of the Year. 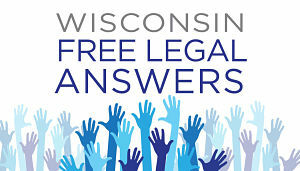 The Commission is also grateful for the number of groups that have organized “answer parties” to combine a social event with answering questions on Wisconsin Free Legal Answers, including CUNA Mutual Group, Quarles & Brady, the Milwaukee Justice Center and the Dane County Bar Association. So far, 2018 is shaping up to be another very good year for WFLA. Here’s a look at what 2018 looks like compared to 2017 through the end of July.